Do Not Forget Your Pills takes over the apple watch! Last month, in March, we wrote about the app “Do Not Forget Your Pills” an amazing application that helps you remember all the medication, pills and vitamins you have to take throughout the day. But “Do Not Forget Your Pills” does a lot more: unlike many other Pill Reminder Apps, this one let’s users create many different plans for medication for different members of their family. 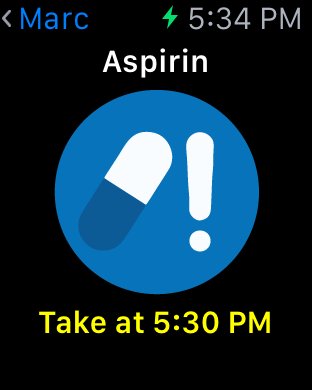 And now: what you have all been waiting for: Do Not Forget Your Pills is nowadays available for the Apple Watch, too! Apple Watch Users can now manage their incoming reminders directly on their wrists. Via the Apple Watch one can snooze or postpone the incoming reminders, as well as mark them as done. Furthermore, you can see all the medication that needs to be taken within a certain time period. As users are used to already, they will create their plans and those for others on their iPhone. They can input intervals, dosage and other details about the medication being taken. Furthermore, the app allows the option of customizing the ring tone for reminders, among other great features. The Apple Watch App will then automatically synchronize the plans created on the iPhone to the Apple Watch of the user, where s/he will from now on see all the reminders for the medication. Like this, the reminders will always reach the Apple Watch user in time, making it impossible to miss your next intake of medication! Like this, you are free to enjoy your day without having constantly to worry about when to take your next medication: Do Not Forget Your Pills will take care of timing and reminders for you. You can just sit back relax and enjoy your brand-new Apple Watch! This is the link to the app. Get it today! What’s ‘Appening With Your Money? What comprises 9 alphabetic dice which can be combined in millions of combinations? Copyright © 2019 Iphone Gamer. Proudly powered by WordPress. BoldR design by iPhone gaming.